Fall for this season’s balance of fun yet sophisticated styles. Launched in Israel almost two years ago, street-inspired children’s brand My Kids Jeans landed stateside in January with an affordable, trend-driven collection centered on—what else?—denim. “We want kids to look effortlessly stylish,” said Esther Silvera, executive sales manager of My Kids Jeans. Designed and manufactured in Israel, all of the collection’s soft, durable, pre-washed materials are sourced from Italy. Available in an array of styles, from acid-washed to distressed, denim silhouettes range from skinny to boyfriend. For boys and girls ages 3 to 15 years, the collection offers shirts, skirts, bottoms and overalls, wholesaling from $21 to $26. Contact mykidsjeans@gmail.com for more info. Megan Linke decided it was time the children’s shoe industry kicked it up a notch. “My husband and I were not happy with the styles and fit of the shoes on the market, and the fact that very few were made in the U.S.A.,” Linke recalls. Taking matters into her own hands (literally), Linke became Manhattan’s next mompreneur by handcrafting a kids’ footwear line, which she dubbed Lili Collection after her son Liam’s nickname. 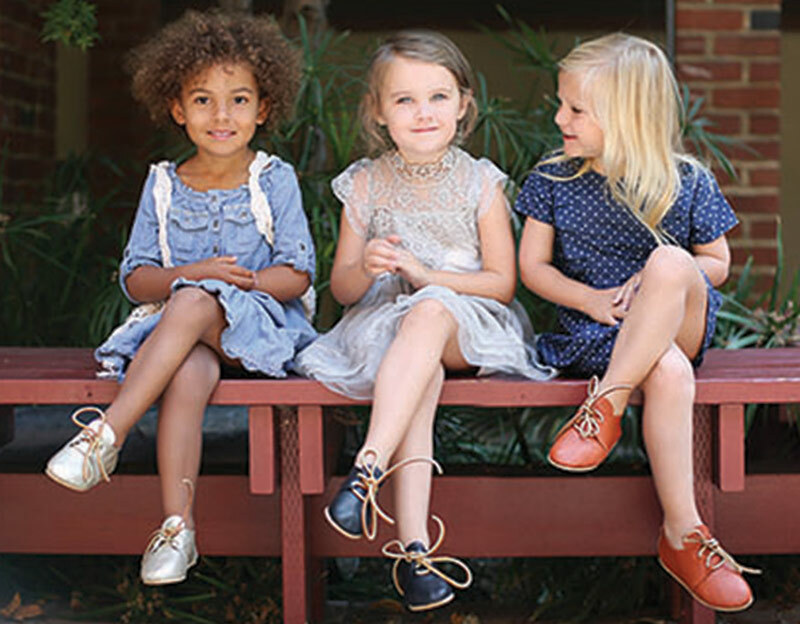 Available from newborn to age 6, the collection offers everything from lace-up oxfords to booties and loafers. Wholesale prices range from $23 to $36, and all of the brand’s designs, including its signature Animoccs (moccasins sporting animals faces) are made in America. Visit www.lilicollection.com for more information. “As parents living in sunny Florida, it was a constant battle between enjoying our time outside and staying protected,” explains Maureen Schmidt. “So we set out to make a collection that is fun and fashionable.” Together with her husband Fred, the duo developed Shade Critters, a line of colorful swimwear that provides UPF50+ protection from the sun. Befitting the couple’s home in Palm Beach, the collection offers a bright array of beach-ready patterns. (Think watermelon, pineapple and palm fronds for girls and stripes, sharks and lobsters for boys.) 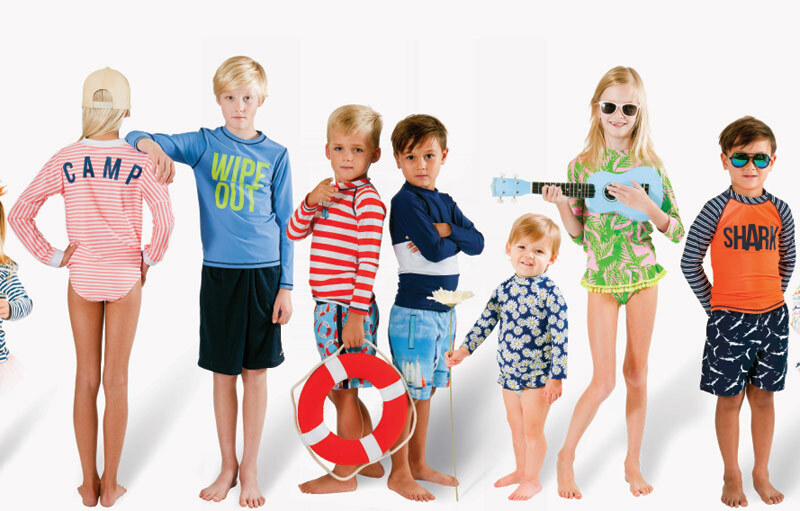 Available for kids’ from 6 months to 10/12, the collection includes swimsuit sets and infant sunsuits, as well as camp shirts and leggings for girls. Retail prices range from $28 to $58. Check out www.shadecritters.com for more information. When Mathieu LeBlanc asked his daughter if she was excited for the end of Kindergarten, she replied, “Not really, I’d be more excited if I was retiring like grandma.” The cheeky 5-year-old served as the muse for Conversations with Romy, a book LeBlanc and illustrator Philippe Lagarde launched in 2013. The book was so well-received that it attracted a partnership with fashion house Nasri International, elevating LeBlanc’s brainchild from words to wardrobe. In Fall ‘14, Romy & Aksel launched in Québec, incorporating Lagarde’s illustrations into a children’s fashion brand. Now available in the U.S., Romy & Aksel aims to appeal to a less traditional retail demographic—dads—with its nap yarns and comfy slub jerseys. Available in kids’ sizes 2 to 8 and infants’ sizes 3 to 24 months, the collection wholesales from $7 to $18. 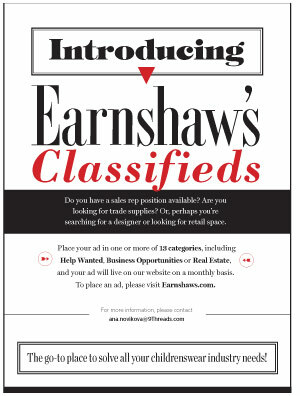 Contact ranya@nasri.ca for more information. Smiling Button, a brand of 100-percent cotton play dresses, debuted last February with the goal of providing girls with easy-to-wear looks that will fit any occasion. “It’s just one dress all day,” says president Caroline Leed. “She goes to school, she goes to her brother’s soccer game, and even out dinner with the grandparents.” Offerings include five classic silhouettes for girls from 3 months to 10 years, in an array of seasonal patterns (as well as preppy staples like plaid, dots and checks, befitting the brand’s Boston home). In fact, fabric sourcing is one of Leed’s favorite parts of the design process. And in a nod to the brand’s name, every dress includes a smiling red button emblem on the skirt. Made in Massachusetts, the dresses wholesale for $36. For details, visit www.smilingbutton.com. Established in Toronto in 2013, Aisabobo was launched by husband and wife co-founders Jinka and Sharon Kagami as a gift for their future daughter. “Aisa,” the intended name for their first daughter and “bobo,” the sound of a kiss on the cheek, unite to form the brand’s unique name. “This is how we want to dress our future children,” explains Sharon. “Very elegantly. 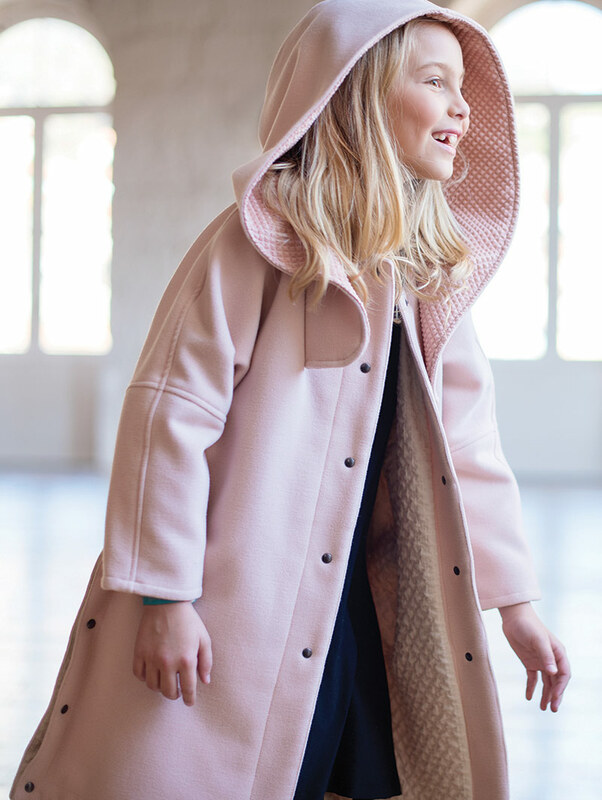 Very classic.” Fittingly, Mozart’s Minuet in G major served as the inspiration for the Fall ‘16 collection, debuting in the U.S. at the January edition of Children’s Club. True to her vision of boys and girls dancing to the tune in a ballroom, the collection comes in a spectrum of classic hues, including black, blue, red and gray. For girls’, the line offers structured yet feminine silhouettes with impeccable tailoring, while highlights of the boys’ line include a black twill blazer with red trim and an ice-gray wool jacket with navy trim. Wholesale prices range from $15 to $50, and sizes range from 3 to 12. Visit www.aisa bobo.com for details. Portuguese-based brand Andorine was launched in 2015 by Maria João Lito and Luísa Amorim, with hopes of sparking passion and adventure in children. According to its founders, the brand’s name comes from the Latin word for swallow, an iconic Portuguese symbol. With each collection comes an original story to inspire young children. The brand’s logo doubles as each episode’s signature character, allowing children to fly around the world with every new collection. Based on Andorine’s journey from Porto, Portugal, to Tokyo, the first collection includes Japanese-influenced pieces, like a kimono-style shirt and a sweater reflective of the nation’s flag. Available in sizes 2 to 14 for boys and girls, the collection offers everything from dresses and jumpsuits to scarves and shoes. Retail prices range from $68 to $370. Visit www.andorine.com for details.